Etihad has been giving Air Berlin a chance to show that its restructuring to a network carrier would work (started last fall). Etihad provided Air Berlin a €350m loan in April, to make continued operations possible. It also said it would continue to support the airline for 18 months. The 1Q2017 results were not good, operationally (Figure 1) or financially (Figure 2). Figure 1. Air Berlin 1Q2017 operating performance. Source: Air Berlin. Traffic went down, costs up and the many changes caused havoc with Air Berlin’s passenger customers. Bookings went down. Figure 2. Air Berlin 1Q2017 financial performance. Source: Air Berlin. As a result, losses increased. For 1Q2017, revenue was €650m and costs €930m (Figure 2, line 1 and 7). The hope was, the restructuring would take bite in 2Q2017. But it didn’t. Once the 29% owner didn’t want to inject more cash to keep the operation going, the management had to file for bankruptcy. The German state was contacted in June to guarantee further loans, but these talks gave no results. Talks between Air Berlin and TUI (Europe’s largest tour operator) also collapsed earlier this year. The idea was to form a joint venture holiday airline by merging TUIfly with Air Berlin’s leisure airline Niki. The losers will be the shareholders (share capital is negative since years), loan givers (Abu Dhabi banks have loans of €800m to the airline) and the lessors who own Air Berlin’s fleet. Aircastle: 1 off A320 from 2007; estimated 0.3% of fleet value. Aircastle shrewdly sold most of its Air Berlin leased planes in Q2 2017. FLY Leasing: 1off A330-200 from 2001. Estimated 1.0% of fleet value. GECAS is also a major lessor to Air Berlin. Of the public lessors, AerCap has the largest exposure. The bankruptcy should come as no surprise for AerCap. The 1Q2017 results told a clear story. It’s now for AerCap to find new homes for the 10 A330-200s after November. 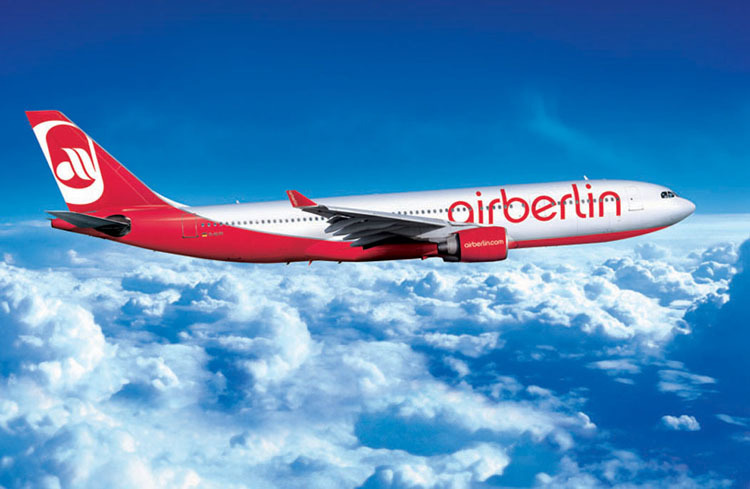 The German state has given Air Berlin an emergency loan of €150m to get holiday passengers home and push the final end of operations to after the German general elections in September. The €150m shall keep the airline operating until end November. Lufthansa wet-leased 38 A320s from Air Berlin in a deal earlier in the year and is interested in taking over more of the airline. It can now cherry-pick the parts which are interesting for its Eurowings low-cost airline. The negotiations have already started. For other parts, like the Niki leisure airline and the majority of Air Berlin’s 8,000 employees, the future is uncertain. For Etihad, it has it two largest partner airlines in bankruptcy proceedings (Alitalia is the other one). Air Berlin has been a Walking Ghost for a year now. Essentially, it is/was a bad bank that retained all the bad assets of AB: bad labour contracts, bad routes. Niki, the Austrian operation, is probably the soundest part. I would assume that the airline is split up liked planned early this year, but without any debt or active labour contracts: TUI takes the holiday flying, Lufthansa the intra-European scheduled operations (maybe retaining the Air Berlin brand for Berlin-bound operations). The long-range fleet (including the pilots and ops) is quite valuable for Eurowings, although AB does have a different type of aircraft (the EW fleet is also a mix of different off-lease aircraft). In the end, a very smart move by Lufthansa to regain “air superiority” over Germany. Ryanair’s complain at the EU regarding illegal subsidies is quite understandable. The new administrator of AB should be able to sell its holdings in Niki and LuftGeshellshaft Walter (LGW) pretty quickly. The leased Aircrafts disappear to the owners with routes and slots most likley given by the Gouverment to Lufthansa and no public auction letting Ryanair/Easyjet/Wizzair complain in vain. The remaining fleet and termination of most emplyees is the hard part. Lufthansa is smart and let the bankrupcy take effect so all the crews they want start with 0.0 years seniority and be last in on the pilot seniority lists with beginners pay unless the goverment put some cushions in for senior cockpit staff. They shouldn’t. High labor costs help drive this organization into the ground, the laborers themselves don’t deserve seniority for any new partial buyers dictated by the governments. I would be very surprised if Air Berlin paid higher salaries than Lufthansa. You mean entry level pilots? It used to be that AB had much lower costs and different collective bargain agreements, but the difference shrunk fast for some reason and is part of the losses leading to bankrupcy. AirBerlin has far too many employees per plane. Their high costs come down to that simple factor. Another OneWorld Member bits the dust. I see that Air Berlin is blaming their problems on the delays in opening the new Berlin airport, but that clumsy attempt to blame anyone except themselves totally ignores the drop in revenues, in load factors, indeed in everything except – ooops – costs as between last year and this year. What a con. Wait till the middle of the holiday season, their busiest time, to announce the bankruptcy. Not only to they get all the revenue from the holiday makers, but they get the German Federal government to pay another €150 mill to bring the holiday makers home. The credit card companies, the holiday resorts and many others benefit from filing for bankruptcy now rather than say months ago when it should have happened. Bankruptcy filings follow pretty stringent rules. You can’t do that on a whim here. Air Berlin had issues all along. But nonetheless the BER delays added another large waggon load of cost to their equation. Compare: you are out of a job and smash your car in an environment where that car is a key building block for getting a new job. The reason why its happened this week rather than say months ago is that Etihad has withdrawn support ‘this week’ as the story says. Withdrawal of a future funds flow turned the perspective side of bookkeeping to “zero”. management was forced to go the “Insolvenz” path. An ordered take-down for infrastructure or just “by largeness” relevant entities is established procedure here. You may lament the timing but that seems to have been Etihad’s choosing. The timing of the filing is when the 2Q2017 results are on the table. Even though you have running accounts, in large corporations you normally don’t see the full picture until you consolidate the company for a quarterly result presentation. This takes weeks. When the naked facts were presented to Etihad they said stop. Important is also that the architect of the Partnership, James Hogan, left the Air Berlin board in May. Ben Hogan or James Hogan? Oops, James of course. Corrected. Ben Hogan was a famous golfer once upon a time 🙂 . More importantly, it is pre-election time, so neither the government, not the opposition will say or do anything that threatens German jobs. The “German” Airlines (LCC’s) set-up always confused me. Could someone maybe draw an “organo-gram” to explain how things stick together at some stage. AirBerlin, German Wings/Euro Wings, TUI, SunExpress Deutschland, Lufthansa City Line, Lufthansa Regional, AirDolomit, etc. Lufthansa Konzern companies, that are operating as separate brands you can buy tickets from: Lufthansa (=Lufthansa Passage Germany), Austrian Airlines, Swiss, Brussel Airlines, the lowcost carrier Eurowings and the turkish leasure carrier Sunexpress (Joint venture of Turkish Airlines amd Lufthansa). Airberlin has wetleased some 1/3 of Aircraft+crew to Eurowings and some to Austrian Airlines. Lufthansa has taken over those aircraft (buying or taking over the leases) in order to trim costs and is leasing those back to airberlin. Germanwings (a Lufthansa company) is leasing all their crews and aircraft to Eurowings. The Germanwings operation is supposed to wind down. Crews will get transfer offers to Lufthansa passage into the best paid conditions of the german Konzerntarifvertrag, the aircraft transferred to Eurowings and staffed to much lower conditions without any collective agreement. Lufthansa Cityline (the former regional carrier for lufthansa) now has been re-fleetet with A340 and is wetleasing crews and aircrafts to Lufthansa Passage (“Project Jump”) for low margin long haul routes. Cityline is part of Konzerntarifvertrag, but with special low cost conditions. Sunexpress germany (subsidiary of Sunexpress) is operating the A330s for Eurowings long haul flights. Brussel Airlines is expected to be moved into the Eurowings brand. Luftfahrtgesellschaft Walter is operating turboprops for airberlin and has recently been bought by them. The leasure crarrier Condor (formerly Lufthansa) is owned by Thomas Cook. Some Lufthansa cockpit crews are still flying for Condor and waiting for vacancies in Lufthansa Passage (they have return rights). Flyniki was in the process of beeing bought by Ethihad from Airberlin. The money was transferred, but the antritrust approval was still pending. Currently it’s unclear who is the owner now. Thanks Nofly. This is more than a mouthful and take a while to digest. At some point there will have to be some form off consolidation/streamlining. LCC’s and these “leisure airlines” may start getting some serious turbulence if the oil price goes above US$70 a barrel? The crisis in turkey and most arabian tourist destinations have already wrecked the balance sheets of european leasure carriers. And because of Brexit Ryanair and Easyjet are now determined to place all planes ordered for growth into continental europe. Condor and Tuifly are already weak and will have a hard time to survive the next years against the Lccs. It looks like very few of the Leisure Airlines have new aircraft on order which is a sure sign of their financial situation. Some still do have some niche over Ryanair, EasyJet and Wizz with higher capacity and longer range (but older) A330-200’s and 767-300Er’s they operate. Wonder if it its one of the reasons why Ryanair is interested in “Alitalia”, basically a hub for longer range destinations including those served by the Leisure Airlines. If so the “797” must be high on its wish list. Whats the cause of all these losses, I’m wondering. What really has cost Airberlin dearly were the many delays at the beginning of this year. That costed millons in EU-compensation payments and really frightened the public masses away. The managers responsible for choosing the new ground handling company in Berlin should be blacklisted by all airlines. Such kind of incompetence borders on sabotage. If you have these managers you don’t need any competition, they will manage to bancrupt you all by themself. The Lufthansa wetlease should be profitable for Airberlin, Lufty even got to the length to take over the aircraft leases or even buy the frames to help drive down the costs. What really has cost Airberlin dearly were the many delays at the beginning of this year. That probably wasn’t cheap – but they managed to lose ~€780m last year without those delays. That amount would cover compensations for ~130m pax assuming they were all delayed >= 4hours and all on sectors of 3500km or more. Sorry, but mismanagement definitely played a role in AB’s decline – part of that was trying to satisfy too many vastly different markets (business, holiday and LCC), and another part of that was biting off more than AB could chew with the takeover of dba and LTU. 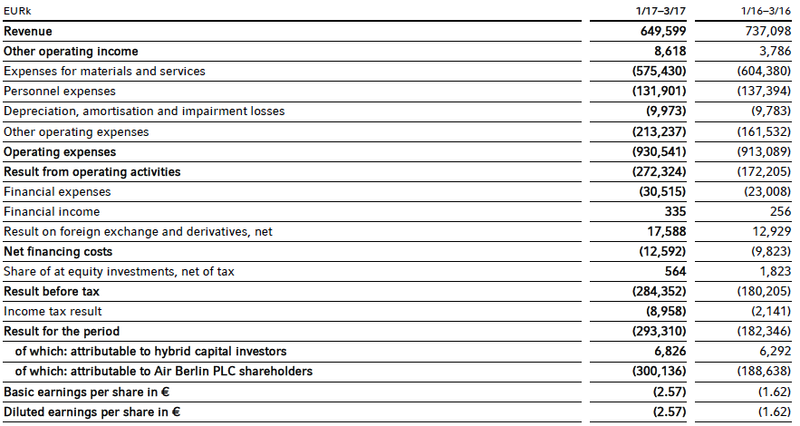 You can pretty much pinpoint the start of losses accumulating to the year after these two takeovers were completed. The date on this article seems to be wrong. It shows 16 August 2016, but should read 2017.